Programmatic buying is dominating political ad spending this year as 85% of agencies plan to use programmatic for their media buying efforts. That is a key finding of a recent STRATA political survey of leading advertising agencies representing approximately 75% of total political advertising billings. Consumers in battleground states should prepare to see a large increase in political ads in the month of October, as the agencies surveyed unanimously indicated that their clients have allocated the highest political ad budgets in that month. Political ad budgets are also healthy this year, as 65% of agencies say client budgets have either increased or stayed the same since the last congressional election. 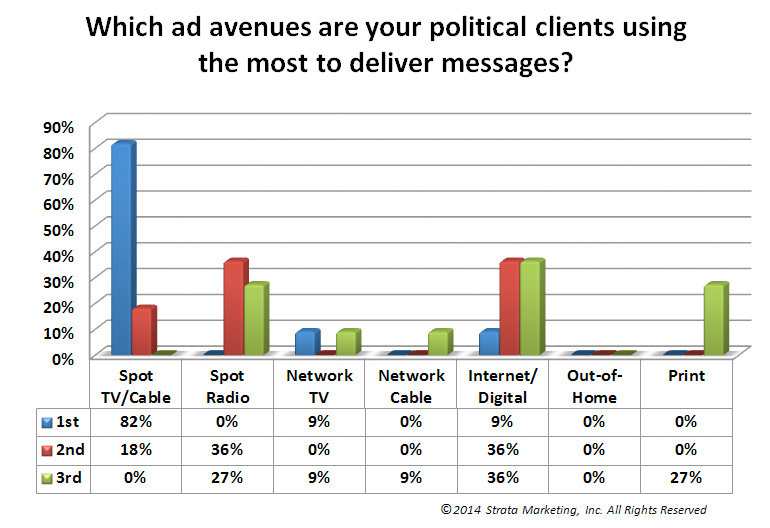 In terms of budget allocation, 82% of agencies say their clients' will most use Spot TV/Cable to reach political audiences. Internet/Digital and Spot Radio tied as the second most used advertising vehicles. Eighty-six percent of respondents also said that TV was just as important to their clients as it was four years ago. Agencies indicate that they are seeing the greatest return on investment through political ad buys allocated to Spot TV (57%) and Online Video (43%). "Our political shops are leveraging tools and social channels that are built for real-time marketing," said Joy Baer, President of STRATA. "Because of its ability to react instantly to changing market dynamics, programmatic buying is a tremendous tool for political advertisers when trying to respond to an attack or get a message out right away." In addition to taking advantage of real-time digital programmatic buying, political agencies are also taking advantage of social channels to communicate. Sixty percent of agencies indicated that they plan to use Twitter in client's political campaigns. Fifty percent will use Facebook, and 40% will use YouTube and Google+.